A bloody and brilliant production from the revered political director, Damiano Damiani. This fantastic film broaches a number of subjects including the plight of peasant villagers, the might of the rich, racism and the pursuit and consequences of power. These themes are topical just as much today as they were in the time period in which Damiani's film resides. Just exactly what the film is saying will be subjective to those watching. One thing everyone can agree on is that the picture deals with the oppression of dirt farmers by the Federales and the looming insurgence of American capitalism. El Chuncho is a rowdy, carefree bandit leader who raids trains and enemy encampments to steal the weapons and ammunition to sell to his idol, General Elias, a Mexican military commander who has been making waves for the Mexican army; the point being to aid the lowly farmers in defending themselves. Chuncho and his gang fatefully meet up with a blonde American stranger named Tate. Taking him as one of them, he's newly christened "El Nino". Tate helps them acquire more weapons, but lets his true intentions become known towards the end after Chuncho's gang has either left him, or been killed in their raids. A fascinating political allegory, this first Zapata western of some repute led to a small sub-genre of similar sagebrush sagas with like-minded, frequently left-wing political views. 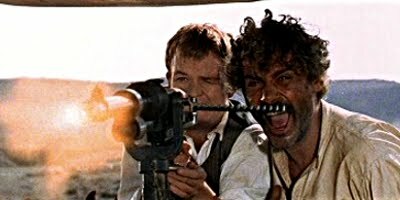 Sergio Sollima was another chief component of Zapata's and like Damiani, his films were elevated above the typical western trappings. Still, there's plenty of sadistic violence to be found here, and it's perfectly balanced with all the exposition and rhetoric towards ones duty to society. Klaus Kinski and Martine Beswicke round out the main cast. Luis Bacalov's score is rousing and perfectly captures the flavor of the Mexican revolution. An essential western and required viewing for any Euro western fan.